Billy Graham was a Baptist preacher (his epitaph). No one in history preached to more people than the globe-trotting Mr. Graham. It is estimated some 215 million people in 185 heard him preach in person. Not even Jesus could make such a claim (unless you count His activities on the ‘third day’ when He descended into Hell, e.i. the realm of the dead, “proclaiming the Good News to the spirits imprisoned there,” according to the Catechism of the Catholic Church). I was struck by two reactions to Mr. Graham’s death. The first came from Catholic circles, where priests, Popes, and the laity alike sung the praises of the late evangelist. Graham struck up a friendship with Pope John Paul II in the early 80s, and had a cordial relationship with many Catholics in his lifetime. The Venerable Fulton Sheen was one, too. Ms. Duca’s comment makes me realize more than ever how much we will miss Billy Graham, and how much the world needs to hear his message. 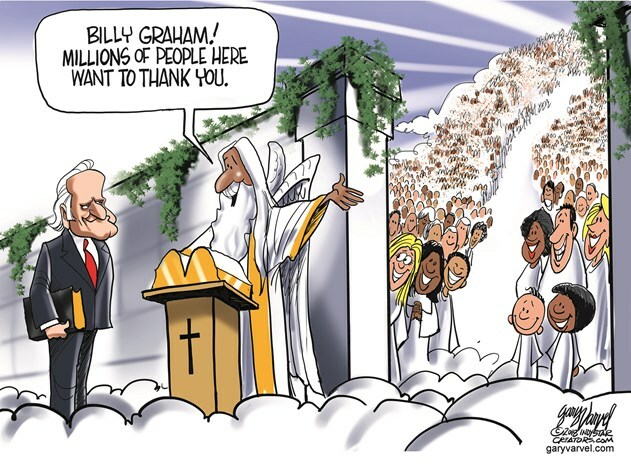 God bless you, Billy Graham. This Catholic suspects that you’re walking with the angels this very moment. Thank-you for you, faithful service to the Gospel. Although Billy is in a class of his own, I feel Billy Graham is comparable to Paul. Leading so many to Christ! The world will miss him so much!! We desperately need more Billy Grahams in this world. So true. Great to hear from you!